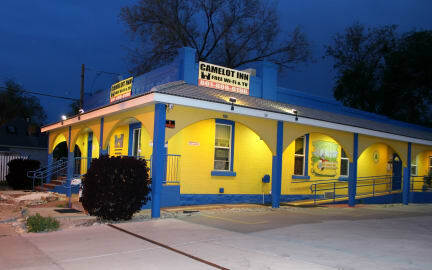 Camelot Inn & Hostel i Salt Lake City, USA : Boka nu! .No: (1)Smoking on the premises; (2)Pets in the rooms; (3)Damage to anything in the room or on the property; and (4)Stealing. Failure to comply will result in a $200 room recovery fee. .No Shows Will Be Charged The Full Reservation Amount! .Please, call us with any questions. .Dorm rooms need to check-in before 10 p.m.
.No multiple room bookings for groups. 1 room per booking only. You cannot book rooms for other people. .For an extra $10/night you can get a single or double room with a private bathroom. This is really a cool hostel, the new creative check-in system is just like playing a treasure finding game! I think this place is even more than a hostel. It also trains you to self-discipline and resolve the problems independently. It is in a very convenient location and has complete equipment, including kitchen, laundry, WiFi and bicycle... you just can't miss such a cool place and a self test! The self-check-in system is AMAZING. As I said, 90% of my time is spent away from home. If all hotels had this system in place, it would ease the weary traveler... It's also attractive for the business traveler too. ...I liked that we could check-in, even though we got there very late. NEW YORK -- Self-service kiosks in hotel lobbies, which let travelers bypass the front desk at check-in, will eventually help hotels stem rising labor costs by enabling them to serve guests with fewer staff. Hilton was the first to launch the kiosks early last year. With 102 kiosks in 42 hotels, they have so far been 'very successful,' Hilton spokeswoman Kathy Shepard said. Hotels have been introducing self-service check-in in large, urban areas that cater to business travelers, already comfortable with the convenience of express checkout. 'Clearly, the business traveler is an earlier adapter of self-service,' said Tom Conophy, chief technical officer at Starwood Hotels & Resorts Worldwide, ... Sheraton, Westin, St. Regis and W Hotels. Source: 'Self-service hotel check-in to increase' by Jui Chakravorty, 2006 Reuters. *ANYONE ARRIVING AFTER MIDNIGHT - If you arrive at this time, you must confirm your reservation details with the Inn ahead of arrival. *DORM ROOMS - We do not check people into dormitory after 10:00 PM to show respect to the people already sleeping. *ANYONE WANTING 7+ NIGHTS - Needs approval from the Hostel. 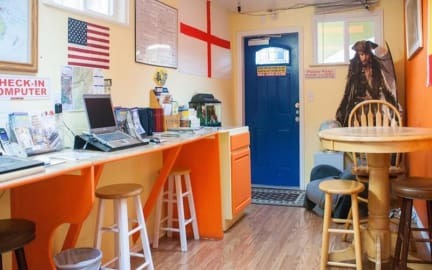 *LOCALS* We are an international hostel, locals only with management approval: (1) They have to talk to us, before we process their booking or it will be cancelled, (2) They have to have a job, no criminal record, and their own credit card with their name on it. *CARDS NOT ACCEPTED: Laser; JCB Credit Cards: if you book with this type of card, then please contact us with a different one; we charge an extra $6 change fee. *PAY WITH YOUR OWN CREDIT CARD: The credit card holder needs to be one of the guests. No pre-paid or cards allowed. For an exception, please call the Inn directly. *CREDIT CARD - The card you book the room with is the card we will charge the total amount due to secure the room. NOTE: within four nights of your arrival, we will authorize the amount due with taxes and fees to make sure there are enough funds; if your card is declined, we may cancel your booking. All major credit cards and USA debit cards accepted. *DEBIT CARDS - By submitting your debit card as a method of payment, you are authorizing an approval to be secured on your checking account for the amount of the booking, including taxes and fees. The amount of the approval will be deducted from your checking account (4 nights prior to your arrival) and thus reduces your available balance. *PAYPAL USERS - We don't accept PayPal. *FOLLOW INSTRUCTIONS IN ENGLISH - You need to be able to do your own self-check-in. * WORKING E-MAIL ACCOUNT REQUIRED - This is necessary so we can e-mail you important check-in information. * AGE RESTRICTION - Adults 18 years and over only. * PETS - No pets allowed in this property (e-mail us for availability at another location). * CRIMINAL RECORD- If you have a criminal record, we will not allow you stay in the Hostel; Your booking will be canceled and your deposit is non-refundable. * DORMS- Depending on availability- you may stay in a two person or a four-person dorm room for the same price. No Shows Will Be Charged The Full Reservation Amount! Our comments are not biased because we don't offer incentives to our guests to write good reviews. We don't tamper with our ratings. All you have to do is carefully read each comment and rating and you'll find the truth. Many restaurants, supermarkets, and coffee shops are located in the surrounding area. * We can provide you with a clean, comfortable, and well-appointed home away from home. A great lodging alternative to rooms in hotels or motels. Go to our website for more pictures and testimonials. * The building is new, fully automated, and modern with state-of-the-art technology (come see for yourself). The owner prefers to invest in the property instead of just taking money out of it. The building is warm; it uses radiant heating and has new double-paned windows. * Camelot Inn offers budget accommodation in a unique home-like atmosphere. No curfew, chores, or lockouts. * Very safe--the doors are always locked; you can only get into the building with a keyless entry code. * This is not a youth hostel; 18 years and over are welcome. * Free use of linen and blankets with any booking. * For the convenience of all guests there are computers with free Internet access, cable TV, telephone with free local calls, private parking, keyless entry, washer and free dryer, refrigerator, and microwave. If you book a room for one week, then you can rent a notebook computer along with your room. Please e-mail us asking for the notebook computer ($1/day extra). * OUR MISSION STATEMENT is to achieve 100% customer satisfaction by listening to our customers and by exceeding their expectations; to offer budget prices for a nice home with added value; and to provide a clean, safe, modern, well-maintained building. * The owners, Arthur and Karla, improve their services by listening to guests' feedback. Arthur graduated in engineering, advertising, and business. He has been in the rental business since the year 2000 and is a member of Salt Lake City Chamber of Commerce and Salt Palace Convention Center. Karla is a flight attendant for a major airline and travels all over the country. Arthur speaks English, Portuguese, Spanish, and French. He has lived in or traveled to Mozambique, Zimbabwe, South Africa, Portugal, England, Spain, France, Czech Republic, and Germany. NOTE: (1) taxes and fees are not included in the price and (2) a $6 charge will be included for the following: any bookings made after 4 p.m., declined credit cards, early arrivals (before 3 p.m.), and booking change requests. Trevligt ställe, något krånglig self-check-in. Tomt , men låg bra och var passade för oss. Lite för mycket regler för vår smak.